Do you struggle every time you go into your closet to find something to wear? It’s not because of lack of choices but rather how everything is crammed in there. It’s time to pull out everything in your closet and sort through it. You’re going to make two piles. One to put back in the closet and one for Junk King Sacramento. Junk King Sacramento are the professional junk haulers you’ll need to get rid of all the clutter you’re going to be collecting throughout your home. The best way to utilize a garage is to hang things up on the walls. 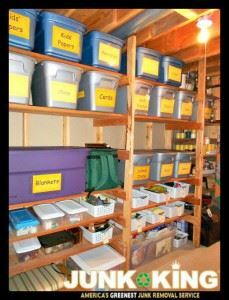 Freestanding shelves can also be used with storage bins. However, if you have to fight your way through all the clutter just to get to your holiday decorations then you know it’s time to toss out what you don’t need. You might need to dedicate a few hours to go through everything in your garage. Just keep thinking about the space you going to reclaim. Just as every other storage area in your home gets filled up with useless clutter, your kitchen cabinets are no exception. All those gadgets you bought that you thought were to make a difference might have only been used once. Are you really going to go back to use them? If not, then they can go on the pile for Junk King Sacramento. Just because you giving away a lot of things that still could be used doesn’t mean that could end up in the trash. Junk King Sacramento is dedicated to keeping as much out of landfills as possible. The bulk of what they collect every week ends up at charities where it is put to good use once again. Are you ready to organize your home? Then Junk King Sacramento is ready to help. This entry was posted in sacramento junk removal and tagged clutter, college, home, organize, rubbish on September 1, 2017 by Junk King. Last updated September 1, 2017 .